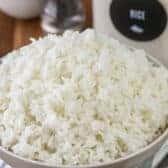 Perfectly cooked light and fluffy rice is easy to make! Place water in a saucepan and bring to a boil. Rinse rice under cold water (optional). Add a pinch of salt and rice to boiling water. Cover and reduce heat to a low. Remove from heat and let sit covered for an additional 5 minutes (no peeking). Some brands of white rice may cook quicker (15-18 minutes) but most should need about 18 minutes.